The Best of Bridge Slow Cooker Cookbook is packed full of delicious recipes for your family to enjoy. In this cookbook of 200 recipes, you’ll find recipes for any meal of the day right from breakfast through to dessert. No matter your preference of meat (or meatless dishes), you’re sure to find many recipes to enjoy. RobertRose.ca was kind enough to send us a copy of Best of Bridge Slow Cooker Cookbook to review. We’re big fans of the slow cooker in our house. I love the smell of the food cooking throughout the day. We’ve always found that the food from the slow cooker is packed full of flavor. In the Best of Bridge Slow Cooker Cookbook, you’ll find tips to get the most benefit from your slow cooker. It even includes a Slow Cooker 101 section! We tested out 2 recipes: Pulled Pork on a Bun & Cranberry Party Meatballs. The Pulled Pork on a Bun looked a little overwhelming at first with the long list of ingredients and instructions but it was surprisingly easy to make. Once we tasted it we realized that it was well worth the effort! The pork turned out really tender and very flavorful. This is certainly a recipe we’ll make again! We’ve also tried out the recipe with chicken instead of pork and it turned out perfectly. I prefer the chicken while my husband prefers pork in the recipe. The Cranberry Party Meatballs call for turkey meat in the recipe. We make a lot of ground turkey dishes so we knew we’d enjoy this recipe. These meatball were different than any I had tasted before and we really enjoyed them. The ingredient list wasn’t typical for a meatball recipe with ingredients like dried cranberries and pecans but it was delicious. This would be a great appetizer to serve during the holiday season. 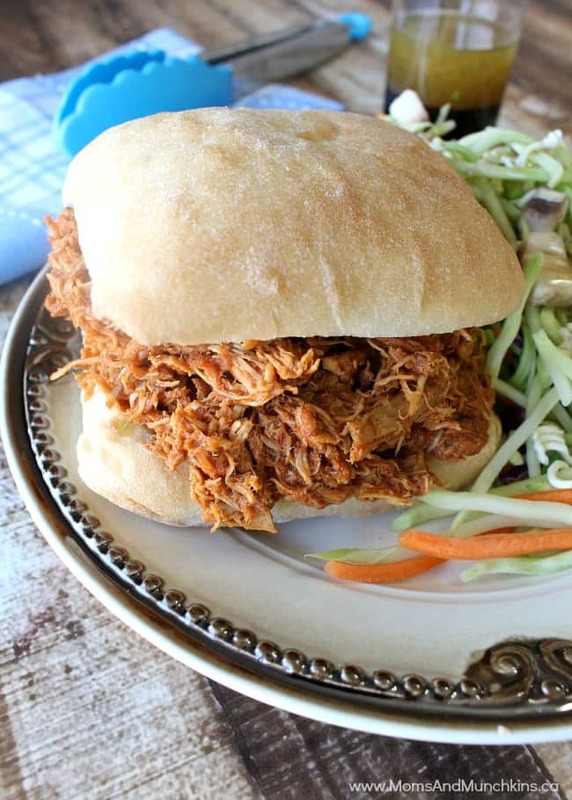 This delicious pulled pork recipe will be a hit with both parents and kids. Use a 5- to 6-quart slow cooker. In a bowl, combine 1 tbsp (15mL) brown sugar, paprika, chili powder, mustard and salt. Rub all over sides of pork. Whisk together soup mix and broth; pour over pork. Cover and cook on low for 8 to 10 hours or on high for 4 to 5 hours, until pork shreds easily with a fork. Transfer pork to a plate and let cool slightly. Using a spoon, remove excess fat from surface of sauce. Pour sauce into a large saucepan and bring to a boil. Reduce heat and simmer for about 20 minutes, until syrupy. Stir in remaining brown sugar, cayenne, chili sauce, vinegar and soy sauce. Simmer for 10 minutes to blend the flavors. Adjust seasoning with salt and cayenne, if desired. Meanwhile, transfer pork to a cutting board and add accumulated juices to sauce. Using two forks, shred pork, placing it in a serving bowl. This is a super-messy job but worth the effort! Pour 1 cup sauce over shredded meat, turning pork to absorb sauce. 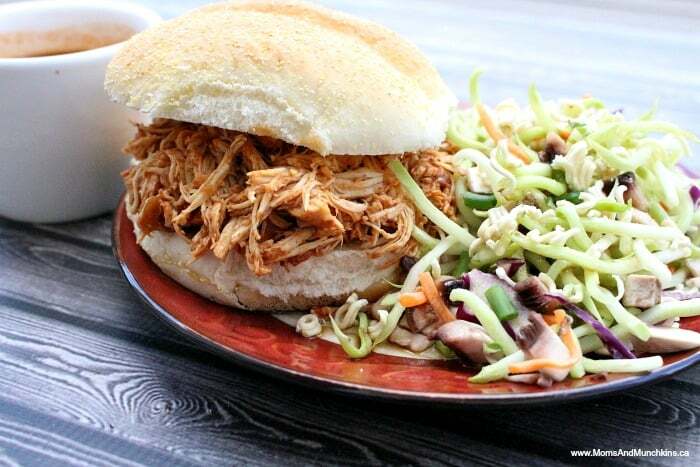 Serve pork on warmed buns, topped with coleslaw, with extra sauce for dipping. These unique & tasty meatballs will be a party favorite! This recipe makes about 30 meatballs. Use a 3½ to 4-quart slow cooker. In a large bowl, combine garlic, bread crumbs, cranberries, sage, salt, pepper, and egg. Let stand for 5 minutes. Add turkey and pecans. Mix well. Using about 2 tsp (10 ml) for each, shape into meatballs. Brown meatballs in two batches. The meatballs might still be pink inside but don't worry, they will finish cooking in the sauce. Transfer meatballs to slow cooker. In a saucepan, combine onion, cranberry sauce, broth, tomato paste, mustard and vinegar; bring to a boil. Reduce heat and simmer, stirring occasionally, for 5 minutes. Cover and cook on low for 5 to 6 hours or on high for 2½ to 3 hours or until meatballs are no longer pink inside and sauce is thickened. Set the slow cooker to keep warm and let guests help themselves. To purchase your own copy of Best of Bridge Slow Cooker Cookbook, visit RobertRose.ca. This book retails for $29.95 US. We paired the pulled pork sandwich (pictured above) with Japanese Salad. Stay updated on all the delicious ideas by following us on Facebook, Twitter, Pinterest and Bloglovin’. *Disclosure: Although we received a complimentary copy of the Best of Bridge Slow Cooker Cookbook, 100% of the opinions expressed here are my own. OMGEEH! 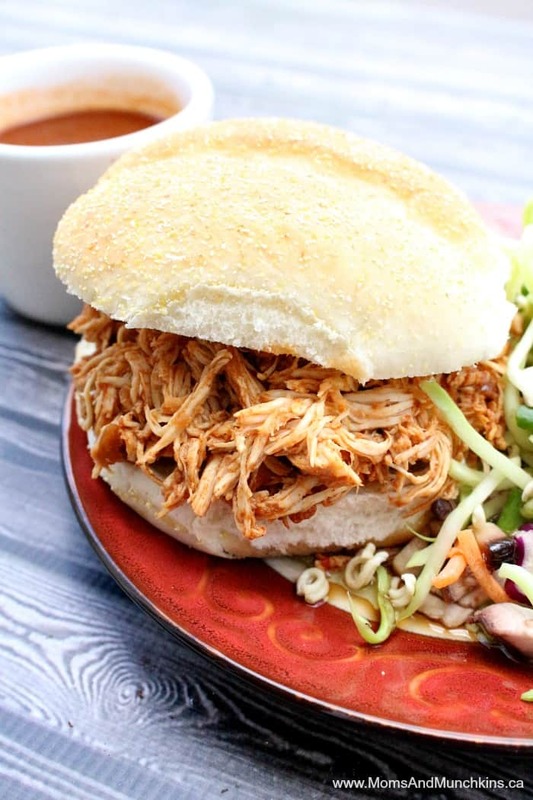 The picture for that pulled pork is making my mouth water, it looks sooo good! Any cookbook with recipes for the crock pot is okay with me! pulled pork is my fav…. I love my slow cooker! Whenever I make pulled pork, I do it from a little envelope and always think, there has got to be a less chemically way to do this. THANKS! Love using the slow cooker too, always leery about pre-made stuff though. Looks like you had good luck though! I need a good crockpot book! This looks delicious! I love Best of Bridge cookbooks and Slow Cookers so this is wonderful Thanks for letting me know about it. I’ll have to see if I can get one locally or maybe get a copy to review… LOVE IT! I have some Best of Bridge cookbooks although not that one, they have great recipes!